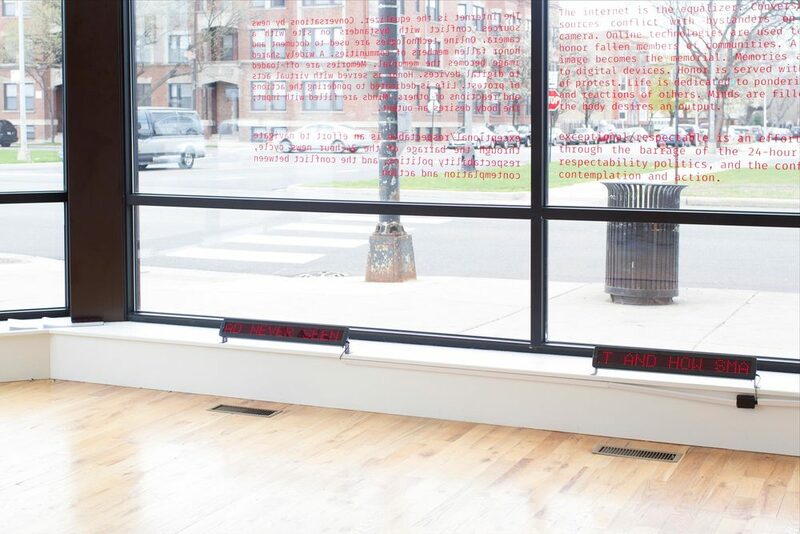 As part of a solo exhibition at the Washington Park Arts Incubator titled "exceptional/respectable", I created a body of work that explored the barrage of the 24 hour news cycle, respectability politics, and the conflict between contemplation and action. Using particularly compelling lines from Officer Darren Wilson's testimony towards the shooting of Michael Brown, I changed instances where he spoke the word "I" and changed them to "we". We see them walking down the middle of the street. And the next thing we noticed was the size of the individuals. We had never seen them before. We had shielded ourselves in this type of manner and kind of locked away. That’s just how big they felt and how small we felt. The internet is the equalizer. Conversations by news sources conflict with bystanders on site with a camera. Online technologies are used to document and honor fallen members of communities. A widely shared image becomes the memorial. Memories are off-loaded to digital devices. Honor is served with virtual acts of protest. Life is dedicated to pondering the actions and reactions of others. Minds are filled with input; the body desires an output. In “exceptional/respectable”, conceptual artist James T. Green’s work becomes his visceral output towards the barrage of the 24 hour news cycle, respectability politics, and the conflict between contemplation and action.